The Property market on Koh Phangan has never been so exciting, with escalating popularity, increasing tourist figures and big business finally seeing the potential in the island. Previously landlocked sites are being opened up with the construction of the island's extensive new concrete road network and the locals are finally willing to sell land that has now reached the prices that they are looking for. Over the last few years, the general rise in property value has been approximately 30% per annum, showing a massive return on often a small investment. One of the reasons for the great increases in land values, is that businesses now have the confidence in Koh Phangan to be one of Thailand's top travel destinations, another reason is it's such a fine place to live! 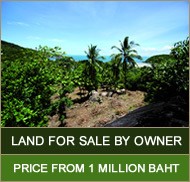 If you are not a Thai National and you want to but or rent land, the process has become a lot easier in recent years; and with good information and guidance services, you'll be surprised how little a piece of paradise can be! Wang Sai Grove is a beautiful plot of land, with an area of just under 4 acres (9.5 Rai in Thai measurement) in the coastal village of Mae Had on the northwest coast of Koh Phangan. It is just 20 minutes drive from Thongsala, the main town and port of the island. The land is a former coconut palm grove, and is now called Wang Sai Grove. Wang Sai is a nearby waterfall which has become a local beauty spot.